What follows is a translation of a blog post by Carbure. It is a collaboration between ourselves & Otto Mattick. The original text was published on Dec. 3rd, 2018. Given what took place on Saturday, December 1st it would be absurd to continue to call what is happening a “movement against expensive life,” or to re-purpose into an economic demand that which evidently is going beyond that. Saturday, “lists of grievances”1 served to help start fires. The Gilets Jaunes movement have already surpassed the stage of making economic demands after the first week, then entered its politically populist phase the following week, demanding that the State recede from the people or that the people become the State. We have critiqued this phase and determined the content of the demands made by lower-class White France within its class mediation, demonstrating the limits of interclassism and pointing out the danger of a popular national union of some against the “others.” We had scarcely made our critique of this phase when we then found ourselves in another one. This movement lacked a dose of nihilism to give its “apoliticalism” some meaning: the meeting with the “banlieues” brought with it what this movement lacked to correspond with the “real movement2”, which is not a movement of social progress but the movement for the destruction of society and this meeting allowed this movement to joyfully recognize the “real movement” as its home. Interclassism has under pressure turned into a unity between those who know either clearly, or in a confused way, that they can expect nothing from this society, that they were relegated to the banlieues, shipwrecked in the nightmare of the peri-urban pavilion and RSA3 recipients who survive by collecting chestnuts in Ardèche. It was necessary to watch the dead army of the trade-union march go by at Place Bastille, hidden behind its flags and its slogans, affirming the particularity of its workmen, and feel the total indifference of those who, whether in yellow vests or not, were walking aimlessly but together in Paris, to understand how much the old workers’ movement and its unions, its representatives and its demands are a thing of the past. There will be no “social convergence,” this movement did not come to be from Leftist reason and it will never be a social movement. That era is gone. It is no longer a question of anti-racism or anti-fascism, of Left or Right, when the only thing to be done is burn everything and to know with whom you can accomplish this. This state of affairs is as much about civil war as it is about revolutionary overcoming: to take the step that leads from insurrection to revolution is to walk on the blade of a sword. To avoid this the disorder must be pushed further. The moment of the urban riot is itself the limit of what is now happening: historically it corresponds with two modalities, either the seizure of state power or pushing the state into a crisis to then push for concessions. But this is not 1917, no seizure of state power to then realize a socialist program is conceivable, and we are not in 1968, there were will be no agreements made at Grenelle5. 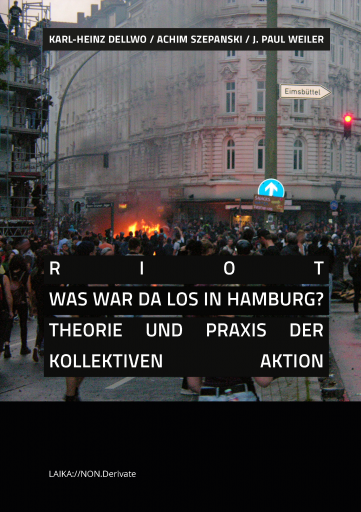 To stick with the urban riot is to remain at a level where the movement still has politics. 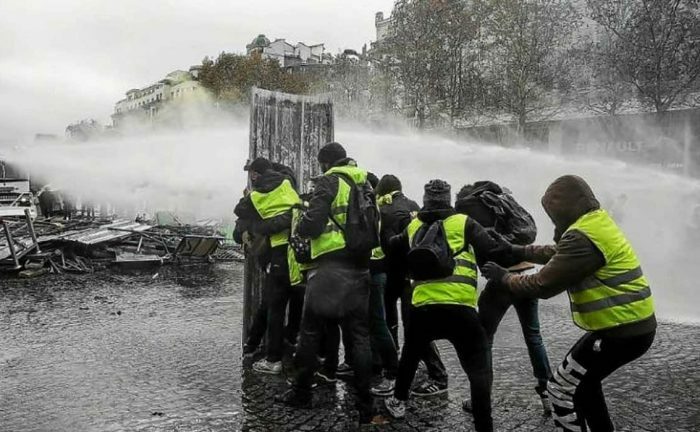 But if what manifested on Saturday in Paris and everywhere in France returns to the blockades, creates new ones and begins to truly “block the country,” that is to say, to seize itself and to decide from there on its future, one can imagine going from riot to uprising to revolution. But no one can say in which direction this is going, this thing running faster than the whole world: there is no better mark of revolutionary content than this. This movement, because it is a class struggle, bears all that can be today a communist revolution, including its limits, its dangers and its unpredictability: but to reach that point, it will probably be necessary to burn a great deal of these things that stand between us, whether its cars or social relations. 3Revenue de solidarité active: a French form of in work welfare benefit aimed at reducing the barrier to return to work (source:Wikipedia). 4tr. “MAY THEYS ALL GO!” (spanish); a phrase made famous after the deep economic crisis Argentina underwent in 2001.